Yin Yoga is a practice centered on relaxation for both mind and body. This particular Yin Yoga practice will guide you through 35 minutes of deep stretching, conscious breathing, and yummy poses that will melt your stress and tension away. This practice is specifically designed to open your shoulders and hips – two areas in the body that tend to store a lot of tension, tightness, and even past trauma. 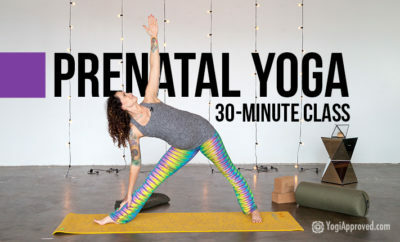 This is also the perfect yoga class for anyone dealing with digestive issues – from bloating or gas, to cramps and PMS, or stomach aches and digestion in general. Curious about Yin Yoga and its many benefits? Read this: What is Yin Yoga and What Are the Benefits? For today’s Yin Yoga practice, you will need: a yoga bolster (or a pillow or couch cushion etc if you don’t have a bolster nearby), and ideally two yoga blocks. If you don’t have blocks, you can substitute books, water bottles, or opt to practice without them. Finally, keep a yoga strap (a belt or scarf can substitute) and blanket nearby as well. Meet YogiApproved teacher Carrie Varela on your mat and prepare for a wonderful full body stretch, relaxation, and rejuvenation. You’ll come away feeling refreshed, calm, and peaceful. Plus your body will thank you! Enjoy your Yin Yoga practice, and feel free to reach out with comments, feedback, questions or requests in the comments below – we love hearing from you! Peace and namaste, yogis. What Is Yin Yoga and What Are the Benefits? Yin Yoga targets the deep connective tissues, bones, joints, and fascia in the body to offer countless Yin Yoga benefits. Here's everything to know.